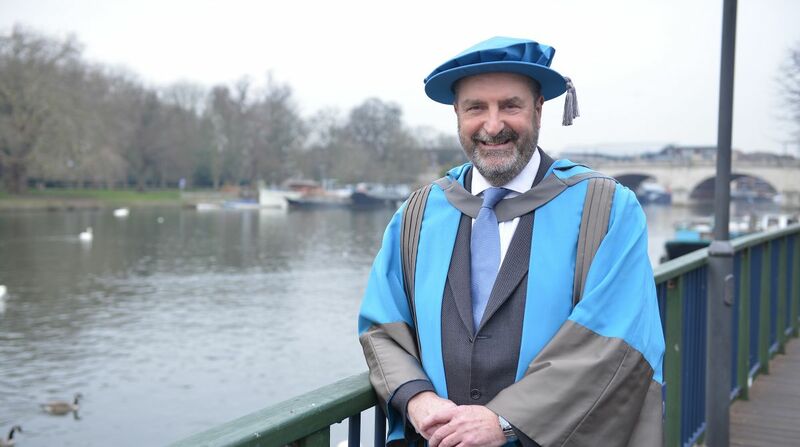 The former chief executive of Kingston Council who was instrumental in bringing Olympic cycling to the borough and transforming the town's cultural and night life with the creation of the Rose Theatre has been awarded an honorary doctorate by Kingston University. Bruce McDonald served as the Royal Borough's most senior non-political appointee for 15 years, from 2000 to 2015. A champion of equality and an expert in leadership, he rose through the ranks of the local authority after joining the organisation as a personnel officer in 1980, following a stint as a lock keeper on the River Thames. He started his transformation from waterman to HR professional with a personnel qualification from the University's predecessor Kingston Regional Management Centre, part of Kingston Polytechnic. He is credited as an instrumental figure in bringing both the Rose to Kingston and the University's graduation ceremonies from central London to the heart of the town. To receive his award at the theatre venue he helped create added extra poignancy to the occasion, he said. "I love the way the graduation events bring life and vitality to Kingston - and seeing graduates and their families taking photos in the town and walking around in their gowns epitomises that," Mr McDonald said. "It's also a celebration of something I've always believed - a strong Kingston needs a strong university, and vice versa. "The University's graduation ceremonies used to take place in London, and I was absolutely determined they should happen in the centre of Kingston because I could envisage what they would bring to the town. It was one of my most epic efforts of will - I just said it was going to happen. They symbolise the close connection between the University and town ­and highlight how important it is for the borough to have a thriving university and equally, for the institution to know that its strategic partner is an ambitious place that will help it to grow, Mr McDonald said. Mr McDonald said one of his proudest moments was sitting next to Sir Peter Hall at the opening of the Rose in 2008. It only happened through clear vision and dedication to the idea that bringing the theatre to the town was the single most practical thing we could do to transform Kingston after dark, he said. Mr McDonald said one of his proudest moments was sitting next to Sir Peter Hall at the opening of the Rose in 2008. It only happened through clear vision and dedication to the idea that bringing the theatre to the town was the single most practical way to transform Kingston after dark, he said. Addressing graduates at the ceremony where he was made an honorary doctor, Mr McDonald shared some tips with graduating students from the University's Business School about successful leadership and the importance of strategic vision. "I believe the most important thing about leadership is putting vision at the front, particularly in public service. People want to make a positive difference, they want to be part of something they can believe in. People seldom ask to be better managed but they do want to be better led." The biggest thing to change during his time as chief executive of Kingston Council was that the borough became a place that was increasingly confident in itself, outward looking and ambitious to be the first place to do things, Mr McDonald said. "We launched the first business improvement district in London, because we recognised that we needed to do something like that to bring in the investment we needed for the future," he said. "We became a go-to place for Transport for London when they wanted to do things, and that reputation spread to the organising committee for the London Olympics. It lead to the town becoming part of the route for the road race. The original plan for the time trial was to have it in the centre of London, but when they started running into difficulties, they came to Kingston and it fitted with our vision for the future. We knew getting that much attention and focus on Kingston would be really powerful." Kingston University's Deputy Vice-Chancellor Professor Martyn Jones praised Mr McDonald for the instrumental role he had played in transforming the experiences of people across the borough in his role as chief executive. "The University is proud to recognise Bruce McDonald's achievements and contribution to the life of both the borough and the whole of London. Under his leadership as chief executive of Kingston Council, the University's relationship with the borough flourished and we have been able build upon that foundation to achieve the strong partnership we enjoy today."